My wife and I along with a close friend and partner started the Adirondack Beef Company several years ago, because we had a sincere interest in producing and marketing our own livestock and meat. 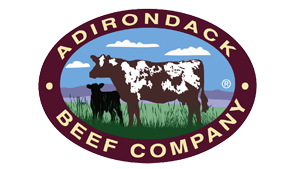 The Adirondack Beef Company was born by our desire to produce high quality naturally raised food while allowing us to keep our farming operation viable and sustainable for the future generations of our family. We chose natural production because we had two young children and wanted them to grow up healthy and strong eating nutritious food raised with our own hands. We use no antibiotics or growth promotants with any of our livestock and were natural long before it was in vogue. We are very conscious of the land that we farm on and are good stewards of it, so that it will be there for many future generations. We currently raise Beef, Pork, Pastured Chickens and Turkeys. Our Beef is raised on a forage based diet for most of their lives. Our Pork is raised in large, open airy pens with access to fresh air and sunlight. Our Broiler Chickens and Turkeys are raised on pasture and fed grain as poultry are not ruminants (can’t survive on grass alone, they need grain to live) like Lambs and Beef. Our poultry production is seasonal from April to November as they are raised outdoors and wouldn’t survive our harsh winters. We are BQA (Beef Quality Assurance) and PQA (Pork Quality Assurance) certified producers which is a fancy way of saying we meet some very high quality standards to raise our beef and pork! Our Cattle are NYSCHAP (New York State Cattle Health Assurance Program) certified BVD and Johne’s Free which means we are free of these two common diseases cattle can get. We work very hard to run a VERY CLEAN operation! Our goal with the Natural program is to vaccinate and prevent diseases rather than treat with antibiotics and we place a lot of emphasis on animal health and well being on our farm. Healthy, content, well cared for livestock grow better and we feel taste better in the finished product, whether it be our beef, chicken, turkey or pork! Our responsibility is to properly care for the livestock, the land and water resources on the farm and in turn they provide us with a means to make a living and raise our family. Our son Jake is graduating from Cornell University in May of 2018 and is returning home to farm with us which will allow us to work together everyday and allows us to have two generations on the farm. Steve Ledoux at 315-346-1741(Farm), or at shorthorn@frontiernet.net .